Being a prisoner in too many countries can involve extreme privation for an agonizingly long and indefinite time. To cope, you might have only your own mind and what it can provide for some kind of way to maintain your humanity. This play is a creative, if rather slow, psychological drama of a trio of such prisoners trying to do just that. In the early 1990s, two prisoners in Beirut—American Adam Canning (Jeremy Hewitson) and Irishman Edward Sheridan (John Reid)—have been confined for some time with little hope of release. Now, they have a companion, Briton Michael Watters (Stephen Flindall) who is now in the same situation. With nothing else to do, the trio use their imaginations to the utmost as they find some solace in the hellish situation they are in. In a situation where the body is chained, but the mind is free, imagination can be a life raft amidst the madness. 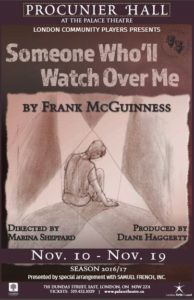 This play is a reasonably entertaining demonstration of that as the characters take advantage of both that and their memories to find some solace in their confined misery. However, the play’s premise practically dictates a leaden pace for the story considering that none of the characters can do anything substantive that is in their control. Regardless of such restrictions, the players make the best of the material to make the story as entertaining as possible. For instance, John Reid pulls off a convincing Irish accent as the most beaten down of the trio even as his grumpy reflexive personality. That mix of curmudgeonly grouchiness and growing despair is a powerful thespian mix for which to create a memorable character. Likewise, Stephen Flindall is perfect as an amiable British intellectual horribly out of his element, where his outdated field of expertise is the only thing along with his memories keeping him sane. Finally, Jeremy Hewitson is excellent as the story’s straight man, moderating the intellectual and ethnic frictions with a guarded optimism of his own, until it proves in vain. Finally the stagecraft is a glory of simplicity with nothing needed but the most basic things like bottles and blankets to suggest a spartan cell. Add to that some beautifully well-timed sound effects, and the dark hell of being a hostage in the chaos of Lebanon is brought to agonizing life. As much as the pace is a burden, this story is a powerful one about confinement, companionship and imagination when one has nothing else.